In the 1960s, a new way of thinking about disabilities, the philosophy of Independent Living, began to replace the older "medical model." The medical model promoted the idea of people with disabilities as defective. It supported the belief that people with disabilities needed to be fixed or kept in an institution where professionals could determine the course of their life, since they were powerless to do so for themselves. A young woman who uses a wheelchair paints on a canvas by holding the paintbrush with her toes. Many people with disabilities refuse to be kept in nursing homes and strive to return home so they can pursue their own interests. Like the woman in this picture, many people with disabilities are able to adapt to life outside of the nursing home. The Independent Living philosophy attempts to eradicate those beliefs. It calls for the right for every person to make decisions about his or her own life and participation in the community. This requires removing the physical and attitudinal barriers in society that keep people with disabilities from being able to make their own choices. The Independent Living movement kicked off when returning war veterans demanded the right to participate in society. They expected the same opportunities as other citizens. At the same time, families were beginning to organize to advocate for better education for children with disabilities. Civil rights movements for the basic human rights of many minorities were gathering steam. A man lies on the ground next to his wheelchair, holding a sign that says "Nursing Homes Kill." Men and women who had been confined to nursing homes advocated for their right to leave the institutions and live independently. Ed Roberts, known as the Father of Independent Living, stood at the forefront of this convergence of movements. After contracting polio at age 14, Roberts used a wheelchair, ventilator, and iron lung. He fought for admittance to the University of California at Berkeley in 1962, first having to argue against being labeled "not feasible for employment," so that he could receive financial assistance from the Vocational Rehabilitation agency, and then having to convince Berkeley to make accessibility concessions. Roberts lived in the student infirmary and began a long process of pressuring the university to make the campus more accessible. Other people with disabilities soon joined him as students and activists, and by 1970, Roberts had founded the Physically Disabled Student Program, with John Hessler as the first director. Soon overwhelmed by people requesting help, Roberts founded the Center for Independent Living in 1972. The center, a community-based private nonprofit and non-residential program, was run by people with disabilities to advocate for the rights of all people with disabilities to work and live in the community. 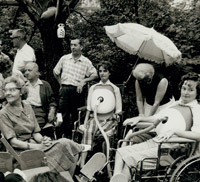 Throughout the 1970s, similar centers were founded across the United States, and the Disability Rights Movement had vocal and active advocates fighting for the rights of people with disabilities to participate in society. A woman holds up a sign that depicts Gini Laurie and Ed Roberts and includes the caption "Gini Laurie and Ed Roberts, grandmother and father of the Independent Living Movement." Gini Laurie and Ed Roberts are regarded as two of the most influential leaders of the Independent Living Movement, and their work to build communities and enable people with disabilities to live in society continues today. The National Council on Independent Living (NCIL) was established in 1982. NCIL became a national force and advocacy group for the civil rights of people with disabilities and legislative changes to reduce barriers. Instrumental in the founding of this national group was Max Starkloff, a St. Louis native. 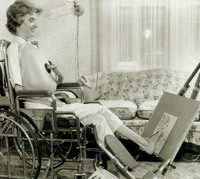 Starkloff was injured in a car accident in 1959 that left him a quadriplegic. He moved into a nursing home because it was "the only option that was available." Eight men and women are gathered on a ramp. Several of the people use wheelchairs. 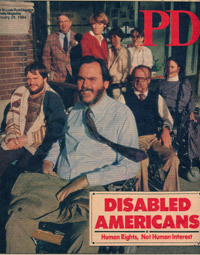 Employees of Paraquad, a St. Louis organization devoted to promoting independent living, gather outside of their office in January 1984 for this cover shoot for the St. Louis Post-Dispatch. Throughout his time in the nursing home, Starkloff saw the loss of his right to make decisions about his own life; even the choice of when to get dressed for the day was not his own. He formed Paraquad, an organization dedicated to enabling people with disabilities to change the terms of their lives, in 1970. He works with his wife, Colleen, to advocate for the full participation of people with disabilities in American life through the Starkloff Disability Institute in St. Louis. Gini Laurie was acclaimed for her long years spent building a community for people with disabilities once they left the insular world of the hospitals and nursing homes. Gini Laurie, one of the "Grandmothers of Independent Living," was born and raised in St. Louis. She saw four siblings fight and two lose the battle with polio. Starting in 1958, she assumed the editorship of the Toomeyville Jr. Gazette, a newsletter for polio survivors. While working in a hospital she saw the benefits of the community created by polio survivors. However, she still firmly believed that leaving the hospital and living at home was the best option, and sought to recreate the community experience outside of the hospital to keep survivors connected. Under Laurie’s leadership, the Gazette became a forum of information on living with a disability, a means for people to build relationships and share common stories, and an organized system for advocacy. She argued passionately for the "right to freedom of choice to live as normal a life as possible within the community." Using the network of readers established by the Gazette, Laurie was able to advocate for the rights of people with disabilities and to organize a national movement, all from her home in St. Louis. A gathering of 7 people in the backyard of Gini Laurie, several of whom are wearing turtle shells, mobile respiratory devices that attach to the upper abdomen to aid in breathing. 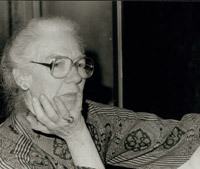 Gini Laurie organized many events that helped to promote the Independent Living cause. For example, at this LSD (Lick, Stamp, Dunk) Party, volunteers gathered to send out mailings and then take a swim in her backyard pool. Several volunteers are wearing turtle shells, mobile devices used by polio survivors that forced the lungs to breathe in and out.